While we are mainly selling bikes, there are a few frame & fork sets put aside for those who want to build a custom Kinn. If this sounds like you, drop us a line at connect@kinnbikes.com or call (971) 266 1885. We’d love to answer your questions and hear about your ideas. Like the fully assembled bikes, the Kinn Cascade Flyer, frame & fork come in two sizes and two colors. By the way we think this frame could make an awesome Adventure Tourer: low bottom bracket, 72 / 72 geometry, robust steel frame, huge load capacity, fits fat tires and fenders. We hope someone decides to build that bike, and sends us photos. 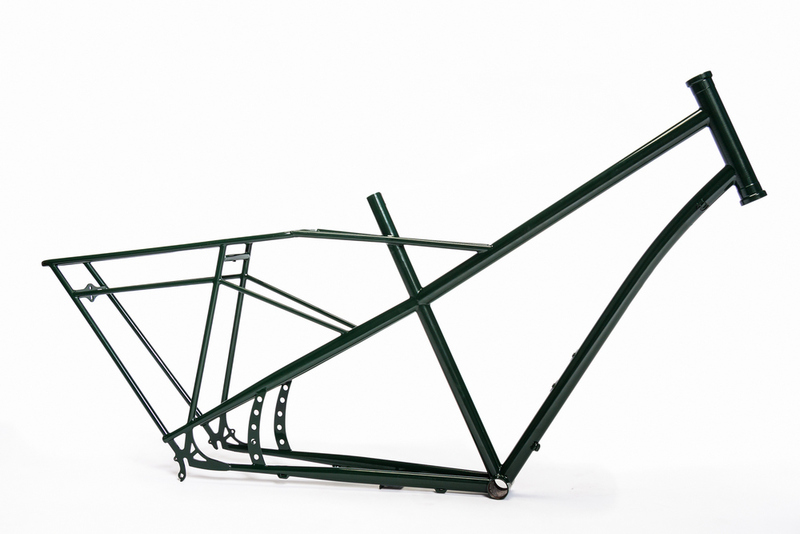 A Kinn Medium /Large frame in Deep Forest Green, just waiting for you. Occasional updates, stories and special offers.